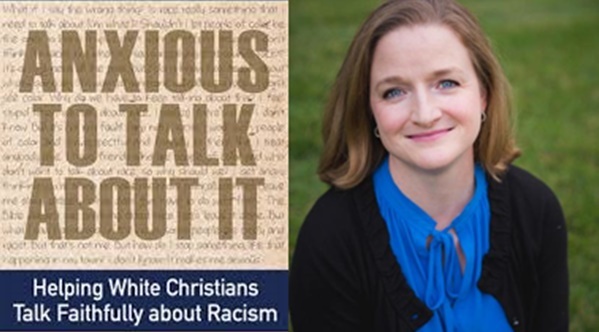 The following is a review of Carolyn Helsel’s masterful book, Anxious to Talk About It: Helping White Christians Faithfully Talk about Racism. I will be interviewing Carolyn about her book this Friday at 9:00 am Central on the Raven Foundation Facebook page. You can join us for free with your comments and questions. As a white Christian, these are a few of the thoughts that run through my head when it comes to discussions about racism. I get anxious. And then I avoid the conversation. If you are like me and experience this kind of anxiety when it comes to discussions about racism, then Carolyn Helsel’s book Anxious to Talk about it: Helping White Christians Faithfully Talk about Racism is a must read. Carolyn’s book is a breath of fresh air. You will not find an accusatory tone anywhere in this book. It’s a firm yet gentle invitation for white people to acknowledge our anxieties and fears when it comes to discussions of race in the United States. As Carolyn suggests, it’s only when we acknowledge our emotions that we can we manage them in compassionate ways. Anxious to Talk about It is also a good reminder that, “There are plenty of opportunities for persons to make mistakes in the work for justice!” Carolyn’s gentleness put me at ease. Mistakes are part of the process of growing and learning. We can expect to make mistakes, and when we do, we can accept them and ourselves in the process. And Carolyn is also firm. She writes about how racism infects our culture. Those familiar with mimetic theory will appreciate Carolyn’s writing for at least two reasons. First, she affirms that we unconsciously receive negative messages from our culture about black persons. Those messages come to us in many forms, including childhood cartoons and in the evening news. Mimetic theory claims we are formed by the “Other,” including the larger culture. This formation is largely unconscious. It’s the sea in which we swim. Often the only way we can recognize those messages is if someone points them out. That’s what Carolyn does so beautifully in this book. Second, Carolyn claims that we need to move away from forming an identity that is in opposition to anyone else. This identity includes our racial identity. There’s a certain sense of shame when it comes to white people talking about race that involves the shame of being white. Carolyn invites us to move beyond that sense of shame, because it doesn’t help anyone. She writes that white people often “do not know how to be ‘white’ apart from this negative history of inflicting racial discrimination onto people of color. It is important for white people to be able to address racism by understanding first what it means to be white, and then be able to understand other ways that a person can be ‘white’ within this history.” The other way of being “white” within the history of racism is to be confessional about the racism that continues to infect our culture, and to work for a future where racism no longer exists. With deep analysis and statistics and storytelling, Carolyn has given us a great gift in her book, Anxious to Talk about It. I hope you aren’t too anxious to join me as I talk with Carolyn about her book this Friday at 9:00 am CT on the Raven Foundation Facebook page!